Wellness Wednesdays are a big deal at St. Luke’s Baptist Church City on a Hill in San Antonio. Pastor Joe Barber’s eyes fill with tears when he talks about it. On those days, people who are struggling to receive much-needed medical services and are treated with love. Wellness Wednesdays have turned into a collaboration of several groups and individuals who work together to meet the needs of those in the area. A retired nurse from the congregation helps with basic things like wound care and a partner organization offers medical testing. When the church does their feeding ministry on Wellness Wednesdays, Barber sits, eats and laughs with those he ministers to. The lunch table becomes his pulpit. He said that in his most recent Wellness Wednesday, three people accepted Christ, and he was able to share his testimony with a man suffering from HIV. 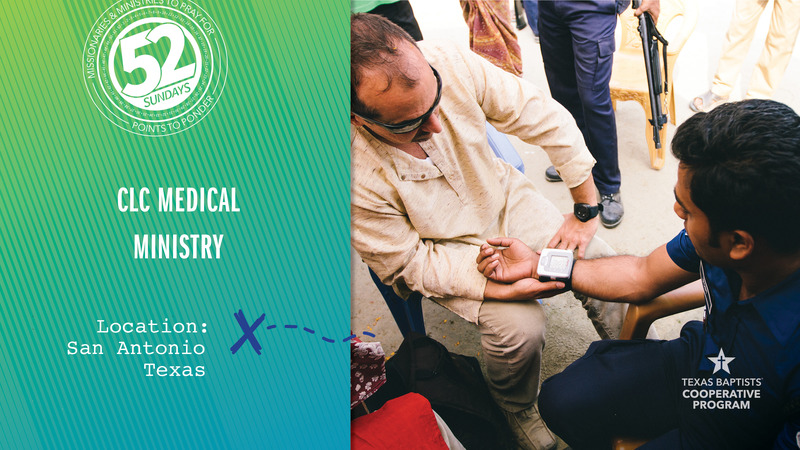 Our church’s gifts through the Cooperative Program help the Texas Baptists Christian Life Commission to provide Pastor Barber’s church with basic health and medical supplies and hygiene kits. Let’s pray now for the medical ministry of St. Luke’s Baptist, that God would multiply their efforts and use them to heal his people both physically and spiritually.